We are in the fourth quarter of 2018 and deal data is now available through the end of the third quarter. In this report, we review our region’s most active industry sectors and give an outlook for Winter 2018/19. Analysts expect positive economic trends to support aerospace M&A activity through the end of 2018 and into 2019. 2018 is on track to be a close runner up to 2017 record deal value, even with the decrease in deal value year over year. Small passenger jets have become a focus and Boeing has moved to purchase the commercial aviation business of Embraer to support their small jet strategy. Original Equipment Manufacturers are increasing production to keep pace with record orders from aircraft manufacturers, which may result in transaction activity among OEMs to support scale and efficiency gains. Cybersecurity and emerging technologies continue to be a focus of aerospace and defense companies. Analysts believe a recent correction in oil prices, inexpensive financing, and divestitures from pending megadeals provide an optimistic outlook on deal activity through 2018 and into 2019. 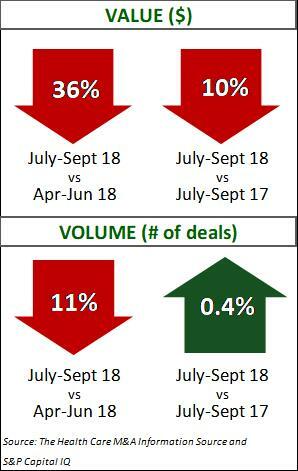 Investments in smaller, niche chemical businesses increased this quarter, which led to a quarter over quarter increase in volume but decrease in deal value. 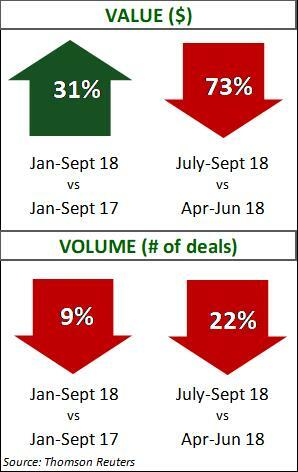 Specialty Chemicals again led in deal volume, while Industrial Gases took the lead in deal value with two large deals in Q3 2018. As trade disputes continue, analysts began to see the first deal activity with the objective to mitigate supply chain disruption from proposed new tariffs. Construction and Engineering M&A activity remained muted during Q3 despite positive economic trends. Analysts believe ongoing economic growth paired with a strong housing market and infrastructure investment will drive a rebound in Construction and Engineering M&A activity. Ongoing trade and tariff tension have led to increased costs of certain key construction materials. New technologies and innovation could boost the M&A market as companies seek to mitigate the rising costs with inorganic growth. The Construction category contributed a majority of deal value while both Construction and the Civil Engineering category led in deal volume. However, current declining new home sales and rising interest rates may become an increasing headwind for the sector in Q1 2019. In Q3, the positive outlook was seen in substantial increases in deal value and volume quarter over quarter. Megadeals in the Midstream sub-sector account for 82% of Q3 deal value; two of the four megadeals were companies collapsing MLPs into C-corp structures. 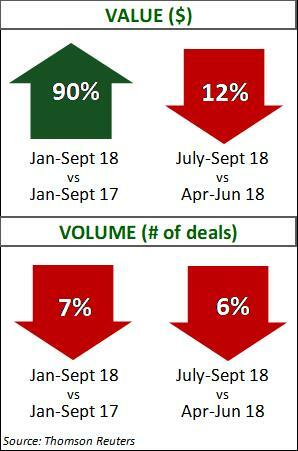 Upstream deals contributed 60% of deal volume. Shale continues to drive upstream activity with 78% of upstream deal volume. The Permian regained the lead with the most shale deals, followed by the Bakken and Niobrara. The Oilfield Services subsector remains muted as buyers and sellers differ on asset valuations. Analysts believe when the increase of crude prices trickles down to the sub-sector, deal activity will improve. The impact on energy sector M&A activity of the current correction in oil prices (WTI trading at $56, down from $76.90 six weeks ago) will not be fully understood until January/February 2019 when Q4 transaction data is released. Commodity price volatility in the coming weeks will be closely watched. A temporary correction will have minimal impact, but a sustained correction may slow down activity. Healthcare M&A activity continues to be driven by high costs, disruptive models, regulation, cross-industry acquisitions and vertical integration. 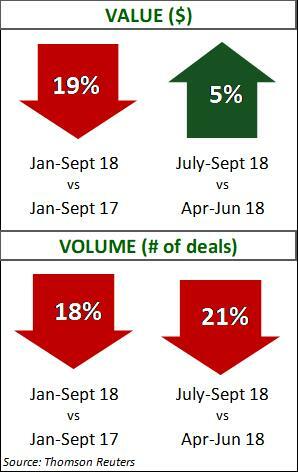 Although healthcare deal volume decreased, the sector has sustained over 200 deals per quarter since the fourth quarter 2014 and over 250 deals since the third quarter of 2017. The megadeals of Cigna – Express Scripts and CVS – Aetna will continue forward as the Department of Justice approved both deals. Analysts believe these megadeals, as well as the entrance of new players (Amazon, Berkshire Hathaway, and JP Morgan venture) will push the industry to contemplate disruptive strategies to counter the resulting systemic changes. 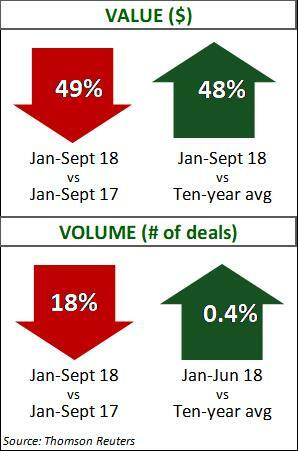 Long Term Care again led the sector in deal volume, while Hospitals led deal value. Behavioral Care also showed substantial growth in deal value this quarter. Analysts see positive markers for future industrial manufacturing deal activity, including: i) projected GDP growth, ii) access to capital, iii) divestures made profitable by tax reform implications and iv) high valuation multiples. Consequences of trade wars and new tariffs imposed by the current administration impacts industrial manufacturing more than most industry sectors. However, analysts are waiting to see if this quarter is a pause due to uncertainty or the beginning of a trend. Midterm elections may have added to the uncertainty with regulatory and economic concerns as congressional changes could affect the current administration’s plans for growth and deregulation. Evolving technologies continue to drive efficiency and innovation, which in turn often leads to increased M&A activity. 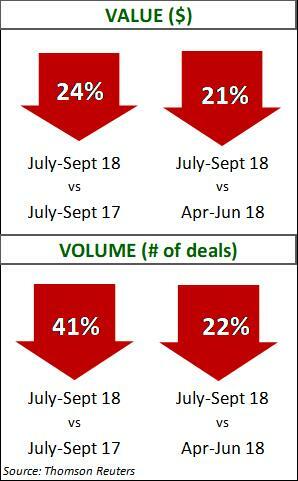 As the Transportation, Logistics, and Distribution sector faces continued trade and tariff uncertainty, M&A activity is subdued. Passenger Ground and Logistics categories together contributed 55% of deal volume and 65% of deal value in Q3. Evolving technology for supply chain management will continue to be an M&A target as buyers deal with e-commerce and the need for speed and efficiency. 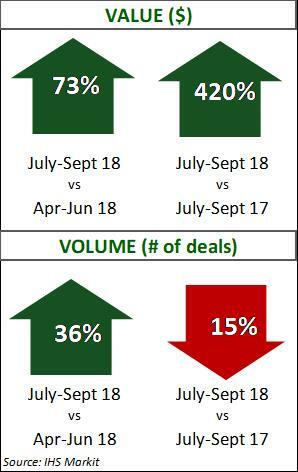 Financial investors outpaced strategics with 63% of deal value, while strategics contributed to 64% of deal volume.